Are you interested in self discovery? Discover how to achieve permanent and meaningful change in your life. Buy “Free The Mind” to understand the inseparable unison of your thoughts, physical body and energy. This truly ground breaking work is a total revolution in personal development. The myth of the “becoming” mindset; how we gain through loss and not adding on. How focusing on the physical look of exercise destroys its true potential. Finding our way out of a society of conformity. Why suffering is a collective issue and not individual. Why when we use the term “MIND” we must include the body. The heightening of suffering by trying to think differently to how we are feeling. Why feelings are more reliable than thoughts. The relationship between emotional attachments and fear. The trigger effect; how not to become controlled by other people. Mindspace; how everything manifests from no thought. How to create space within us to facilitate change. A mind expanding Q&A for you to download. A video tutorial, where Simon shares with you his mediation techniques. A downloadable version of the audio to instantly get started. Having intensely studied ancient Eastern Philosophy as well as cutting-edge Western Neuroscience and Quantum Physics; Simon can help you discover the most effective methods of thinking, moving, breathing, eating, meditating and being. Simon doesn’t teach theory. As with everything he teaches, he’s tried and tested each aspect and knows from first hand experience what works and what is a waste of time. 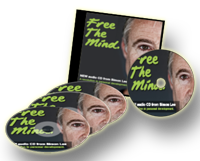 Start your revolution today with Simon’s new Free The Mind ~ Audio CD box set.